Synergy among different digital marketing channels has become increasingly important in the past few years. As customers become more connected, more complex marketing strategies become crucial. Today’s consumers do more than their due diligence when it comes to gathering information to make a purchase. The very same is true about the hotel industry. There are different factors that influence travelers. Some travelers need a hotel that is close to a particular place or one that welcomes their pets. Others want a hotel that will not break their bank or one with copious luxury. Whatever the case, a traveler’s path to purchase is a long and complicated road. For this reason, the single-channel approach is no longer a feasible option. Multi-channel integration is necessary and digital marketing synergy is the main key to success. We all know that travelers spend a significant amount of time online researching hotels. They read reviews and shop around for the best deal. For this reason, the right digital marketing strategy and implementation is necessary. When hoteliers think about digital marketing, it is important to think in terms of goals rather than in terms of channels. 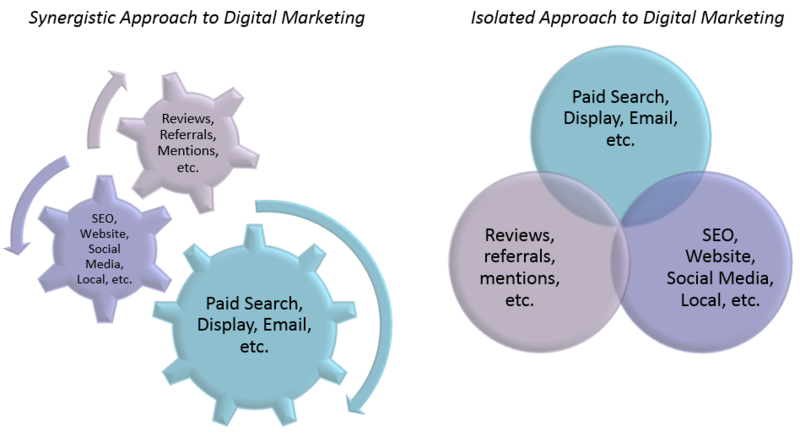 Having separate goals for each channel (PPC, SEO, Email, Social, Local, Display, etc.) results in channel competition rather than synergy. For instance, if your PPC and SEO strategies do not work together toward the same goal, one channel can cannibalize the other and create inefficiencies. On the other hand, when those channels work together toward the same goal, they support each other’s efforts. This synergy results in better targeting, higher reach, lower costs, and higher direct bookings. The belief that multiple channels should work together toward one goal. Thinking of strategy in terms of goals not in terms of channels. Marketing channels that support each other rather than compete with each other.